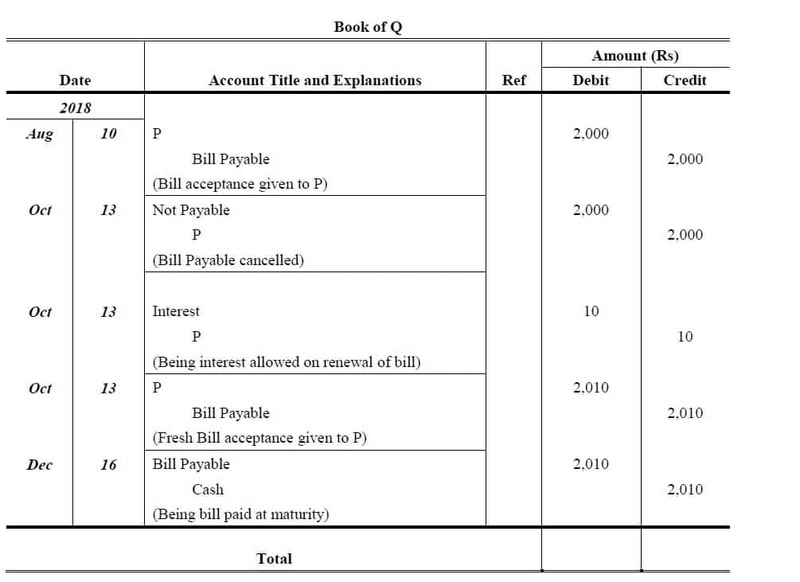 A bill of exchange is treated as a bill receivable by one who is entitled to receive the sum due on it. 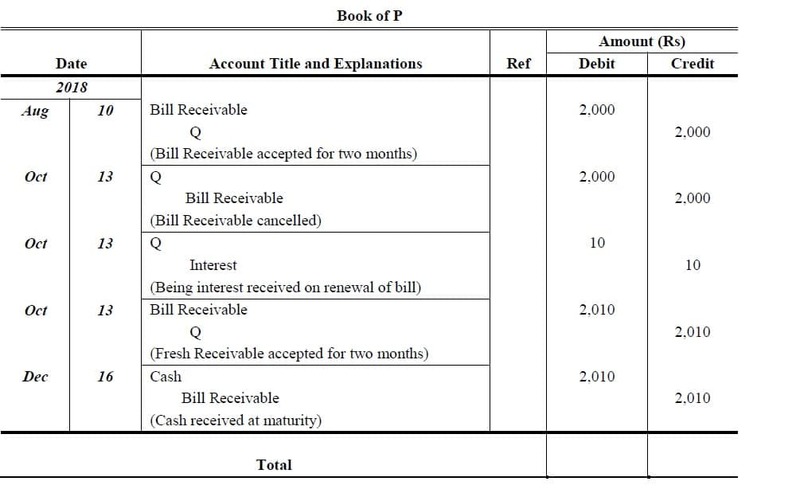 When we draw a bill or receive it by endorsement from our debtors, it is our bill receivable (B/R) and on maturity of such bill if it is held up to that time, we shall receive specified amount from the acceptor. 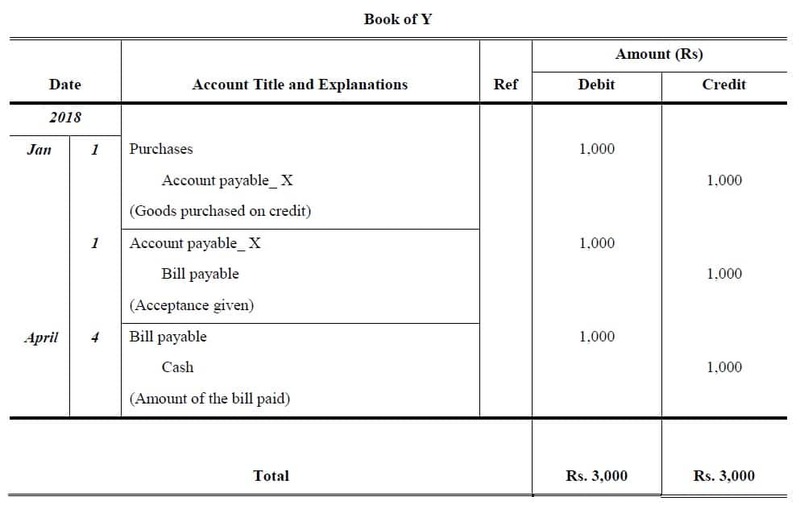 A bills payable is regarded as bill payable by one who has to pay it on the due date. 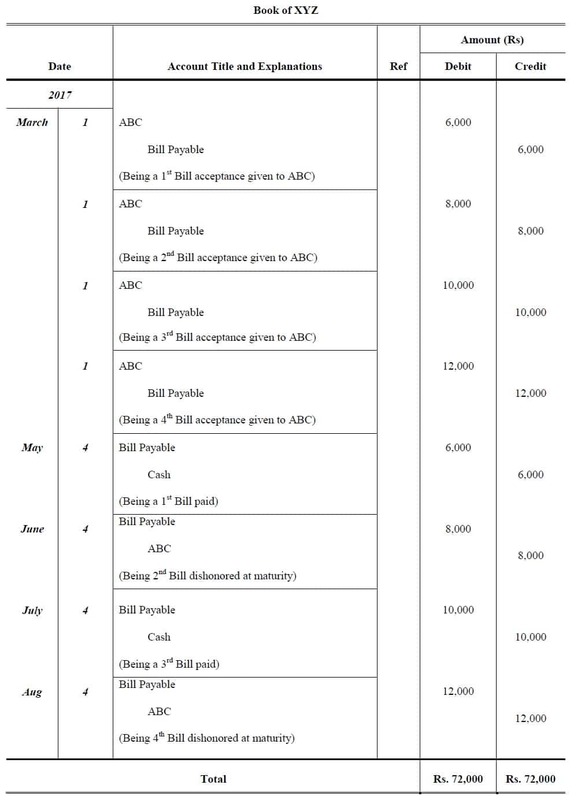 When we accept a bill and thereby become liable to pay on its maturity, it is our bill payable (B/P). It means the same bill is a bill receivable to one party and a bill payable to the other. X sold goods to Y for Rs. 1,000 on 1st January 2018 and draws on Y a bill of exchange at three months for this amount. Y accepts the bill and returns it to X. The bill is dully met at maturity. 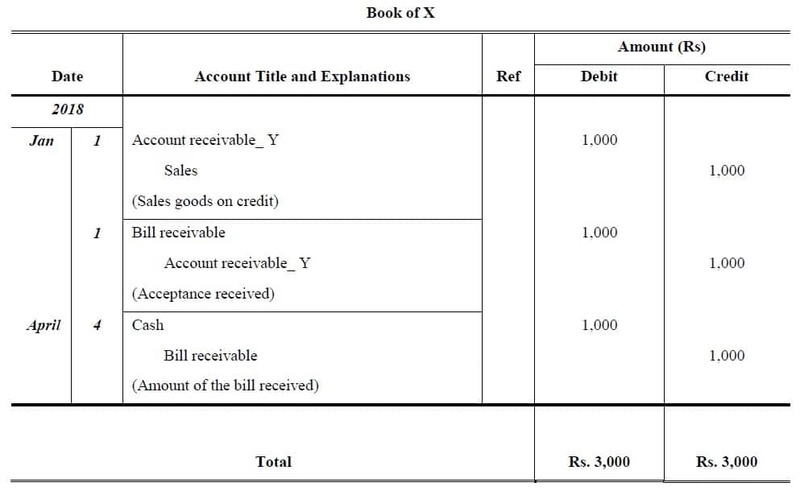 Show the journal entries to record the transactions in both the parties’ books. Mr. Ali draws a three month bill for Rs. 2,000 on Mr. Ahmed on the 1st March, 2018 for the value received. Ahmed accepts it and returns it to Ali, who discounts it on 4th March, 2018 with his bank at 6 per cent per annum. Ahmed pays acceptance on the due date. A bill for Rs. 3,000 is drawn by P on Q on April 1st, 2018 and accepted for 4 month. P transfers it to his creditor R on 20th April 2018. On the due date the acceptance is duly met. Record the above transactions in the books of P, Q and R.
Bills sent to other banks for collection should be endorsed in their favor as agents for collection. A bill for Rs. 1,500 is drawn by Mr. Naveed on Mr. Anees on June 1st, 2018 and accepted for 2 month. Mr. Naveed sends the bill to the bank for collection on 2nd June 2018. On the due date the acceptance is duly met. Record the above transactions in the books of Mr. Naveed and Mr. Anees. A bill of exchange is said to be dishonored when the drawee refuses to accept or make payment on the bill. A bill may be dishonored by non-acceptance or non-payment. If the drawee refuses to accept the bill when it is presented before him for acceptance, it is called dishonor by non-acceptance. If the drawer has accepted the bill, but on the due date, he refuses to make payment of the bill, it is called dishonor by non-payment. On March 1st, 2017 ABC Company received four accepted bills for XYZ Company of worth Rs. 6,000, Rs. 8,000, Rs. 10,000 and 12,000 for two, three, four and five month respectively. The first Bill of worth Rs. 6,000 endorsed to Mr. Akram; the second bill of worth Rs. 8,000 held till maturity; third bill of Rs. 10,000 was discounted for Rs. 50 discount on Bill and last Bill of Rs. 12,000 sent to bank for collection. At maturity First and third bill honored and second and fourth Bill dishonored. Pass Journal entries in the book of ABC Company and XYZ Company. When the acceptor of a bill finds himself unable to make payment of the bill on the due date; he may request the drawer of the bill, before it is due, to cancel the original bill and draw on him a new bill for an extended period. This is called renewing a bill of exchange. The acceptor has to pay interest for the extension of time. 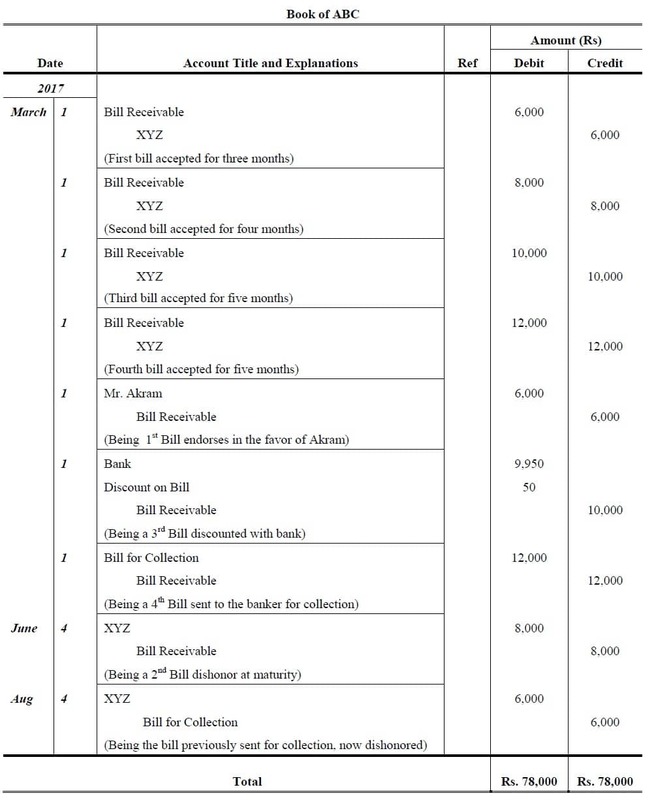 The new bill therefore, includes not only the amount of the original bill but also interest etc. On August 10th, 2018 P draws a two month bill for Rs. 2,000 on Q who accepts and returns it to P. When the about to mature, Q expressed his inability to meet it and request to P to renew it for more two months. P agrees but adds Rs. 10 to the new bill for interest. Give necessary entries in the books of P and Q from draw to last maturity.